Your business runs on QuickBooks and work orders. Don’t you think it’s time you got these things working together? The work order dispatch software Smart Service pulls customer, equipment, and job item information from QuickBooks, allowing you to create work orders with more ease than ever before. Stop relying on paper and pen. Step into the high-tech future. Start dispatching work orders to your technicians with a single button press. If you already use QuickBooks for managing your business accounting, you’re in for a treat. Smart Service is a direct add-on to QuickBooks. This means that there’s no fuss when it comes to setting it up—you already have years of customer and equipment information saved inside QuickBooks! 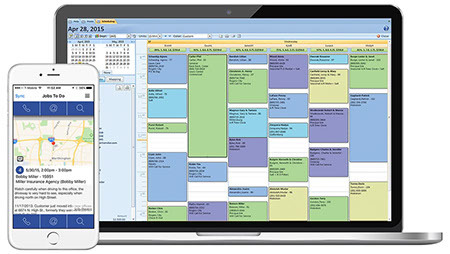 With work order software, scheduling work orders is done the way it should be, with the simple push of a button. Running your field service business is simply faster and better with Smart Service. Using work order software, you can dispatch more efficiently through better communication between the office and your technicians. There’s no more copying down information you’ve copied down a million times before. (By the 3rd time you pretty much have that customer’s address memorized, don’t you?) Smart Service fills in that information for you. Type it once and the system remembers! You save time and money, so you can put more of the two into growing your business. With the Smart Service mobile app, your technicians have everything they need, when they need it. From the work order to previous job and customer notes, your technicians can rest assured that they will be prepared for the job. Did a new job just come up? Look at their schedule and see what technician can handle it. Smart Service notifies the technician so that they can accept the job and add it to their schedule. No back-to-back phone tag between technicians and customers! If Your Business is a Race Car, Then Smart Service is Your Pit Crew. Give your business a head start with work order dispatch software. Leave your competition safely in the rearview mirror with this work order business advice!